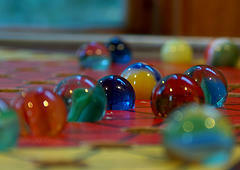 Go and find your marbles before it's too late and find as any as you can. The more you retrieve the further you go. 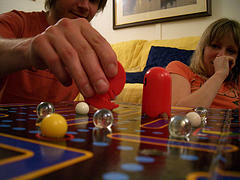 This game is a simulation of a classic game of marbles. 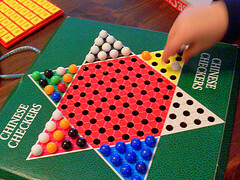 Each player shoots three marbles toward the circles at the end of the board. 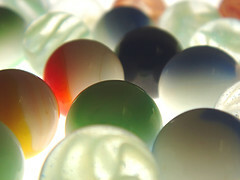 Any marble within the innermost circle at the end of all turns is worth 50 points, any marbles in the middle circle are worth 25 points and any marbles in the outer circle are worth 10 points. 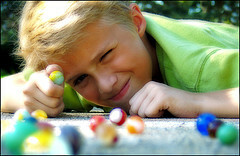 Using a slingshot, knock out clusters of marbles slowly falling down. Using gravity and skill guide your marble into the slot. 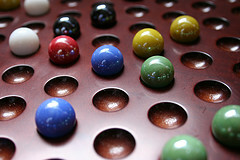 The goal of this classic Marble Solitaire strategy game is to remove as many marbles as possible, by "jumping" one marble over another, either horizontally or vertically. The steady hand bubble maze. How steady is YOUR hand? 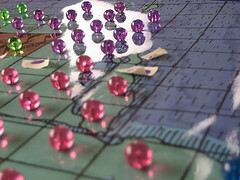 Can you guide the bubble through all five levels? This is very intriguing logic and strategic maze game that requires a lot of planning, foreseeing and manipulation (especially on higher levels). 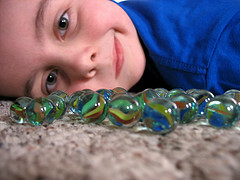 Player controls between two and six heavy marbles revolving them between the walls of echoing corridors. His object is to push them into available holes.